Four years after being killed by his daughter, Freddy Krueger rests in Hell. He depends on the dreams of those in Springwood to fuel his existence. But when the town covers up his existence in an attempt to make people forget, Freddy is left powerless. In a last ditch effort he uses all his power to free Jason Voorhees from his own personal Hell and sends him to Elm Street, determined to strike fear in the hearts of Springwood teens. But when Jason won't stop killing Freddy's Children, Krueger decides its time to take Voorhees out! The film strip portrayed in the image above is only an example of the film cells you may receive. Please note, the cells may vary from piece to piece because they are hand selected from reels of film. 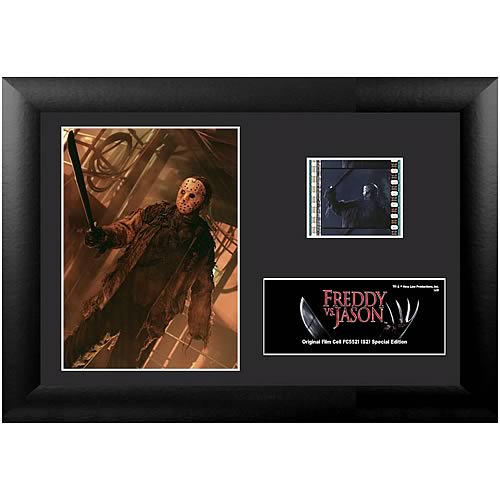 This item contains clips of the film and portrays memorable images and scenes all on a stunning descriptive plaque. These elements have been double mounted and placed within a beautiful black wood frame measuring 7-inches x 5-inches. The Freddy vs. Jason Series 2 Special Edition Mini Cell even comes with a certificate of authenticity. Ages 14 and up.